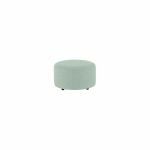 The Jasmine round footstool will bring a stylish flair to any home. Made to match all sofas and armchairs in the Jasmine range, it’s exactly what you need to finish off your living room. Stretch out and relax in premium comfort or use it as additional seating when your home is particularly busy. The soft and durable upholstery promises to provide lasting comfort while maintaining its quality look, and the premium grade frame and solid oak feet ensure strength and durability. With a versatile, round design, it will integrate easily into any scheme.